Both these date from Horenstein's series of recordings for Vox in the 1950s which was the longest association he ever had with one company. It straddled the mono and stereo eras and this is reflected in the fact that the Rite is in mono and the Firebird in stereo. This Firebird always was a fine recording with some well-balanced sound adding to its appeal even in LP days. My own experience of that release was always coloured by what appeared to be an indifferent pressing that was unusual for Vox. Now we are able to hear what a fine achievement this recording was. Sometimes Horenstein can give an initial impression of being a conductor of sober attitudes - a Gielgud rather than an Olivier. But this exotically-plumed fowl struts and preens with dazzling effect and a real classy poise that many of today's flashy young maestri could pluck a feather or two from to put in their hats. The lovely Princesses Round Dance is dignified and serene but coming as it does before a real virtuoso kick from the Infernal dance you sense Horenstein's legendary ability to think across a piece. Notice in the latter also details that you might find to be missing in other issues of this recording now pristine and sharp. Though the solo trombone contributions are as rib tickling as ever. The Finale used to present the greatest problems in LP days when even the best pickups threatened to give up in protest against the whoops of the brass and the cracks of the bass drum, the latter especially well caught. Now all these emerge with little distortion though the 24 bit mastering may have robbed the sound picture of a little atmosphere when compared with a previous CD incarnation on an ultra-cheap Pilz issue. A small point that doesn't detract from the unreserved welcome back I give to this much-loved rendition. Those with an ear for more up-to-date sound should be aware age does intrude in some slight "fizzing" at the top but I for one can live with that. The sound quality on the Rite does call for more tolerance and it isn't just the fact that it's in mono. However, Horenstein's view of this work adds to a feeling of greater astringency and earthiness the sound picture conveys. All the same this work really does demand the best possible sound and playing so be aware of this recording's shortcomings. That taken into account there is much to admire and enjoy in an account that is classical in outline. Notice in the Introduction that no attempt at all is made to smooth out the various woodwind lines. They are allowed to curl and infest each other like insidious bindweed and there's a seamless transition into the Spring Auguries where a splendid downforce is imparted to the punching rhythms. This contrasts well with the Spring Dances where a sense of forward propulsion enters and energy that has been pent-up now finds release. When the orchestra is going full out here the dynamic range of the recording has to lessen in order to cope and I did think the Dance of the Earth that concludes Part I could have done with a real virtuoso orchestra. There is some loss of detail here even though you can hear what Horenstein is trying to achieve in rounding things off before the weird introduction to Part II. This emerges with real distinction, a twentieth century classic if ever there was one that is most unsettling. It would be possible to view Horenstein's very literal, classical account of Part II as lacking in atmosphere and character. Compared with others I think this is true but Horenstein's view is valid. You have the impression of the music almost being analysed from bar to bar. Remember the Rite was by no means as familiar on record or in the concert hall in 1957 as it is today. Even though this is Hans Rosbaud's orchestra I wonder how much the deliberate Sacrificial Dance that closes the work is to be explained by this fact as it is by Horenstein's intentions. True, there is a hypnotic quality to it but I believe the close of this work should go with a greater tilt than this. 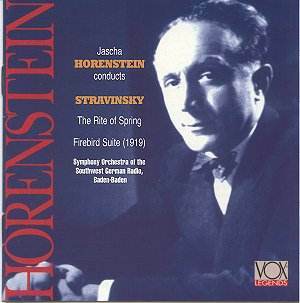 A disc that all Horenstein admirers will be glad to have in their collections and one other collectors should give serious consideration to also. The Rite of Spring is the weaker of the two performances in sound and playing terms but it is one I shall return to nevertheless.